When the weather takes a turn for cool and crisp, I long for savory, belly-filling dishes that fill the house with hearty aromas. A savory bread pudding is a great way to cook from the pantry and use up little bits of ingredients you have in the fridge. 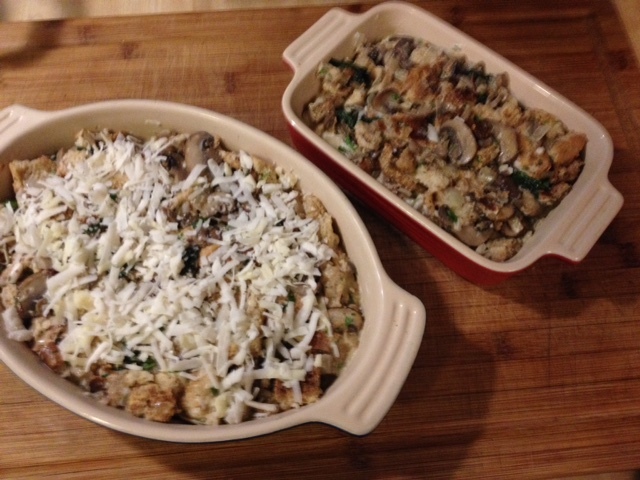 I looked at several recipes for bread pudding featuring mushrooms, then composed my own dish from ingredients I had on hand. 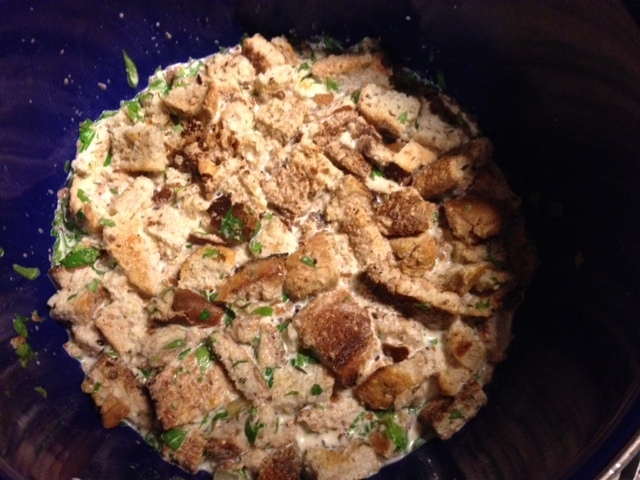 Bread pudding is an economical dish, allowing home cooks to make use of stale or old bread, so recipes that call for a loaf of fresh bread are missing the point. I keep a freezer bag for bread that has passed its prime. 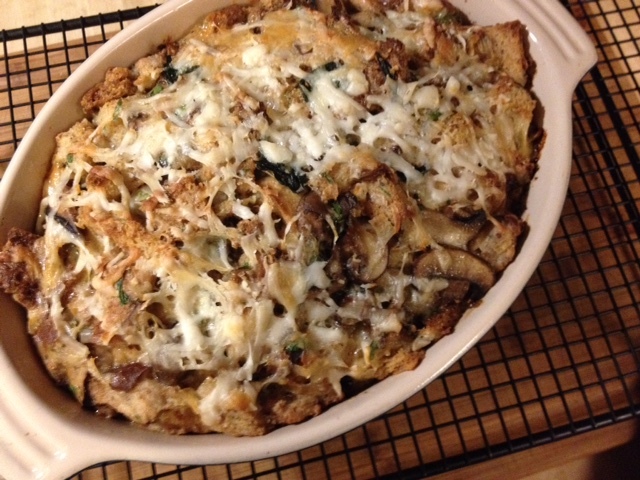 Dried out or stale ends of bread and leftover whole wheat hot dog buns are given new life in a bread pudding. When the bag is full, it’s time to make bread pudding! I put slices into the toaster to thaw, rub them with a clove of garlic, then toast for an additional 10-15 minutes in a 350 oven. About a dozen slices is enough for six servings. While the bread is toasting, saute (separately) sliced mushrooms and chopped onion. 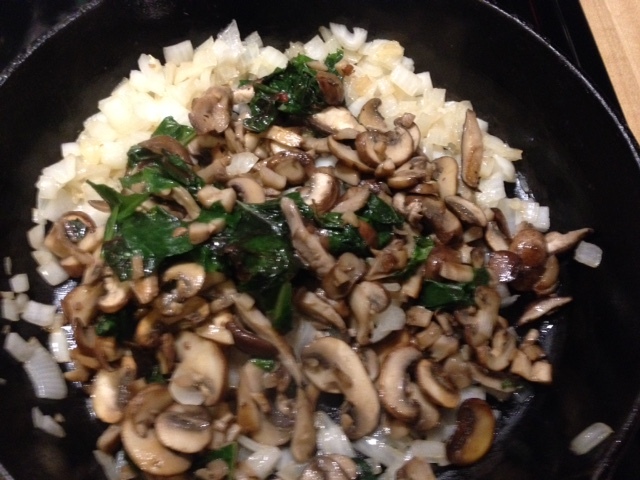 Add everything back into the same pan, and toss in a handful or more of chopped bitter greens like kale or Swiss chard. Remove from heat to cool. 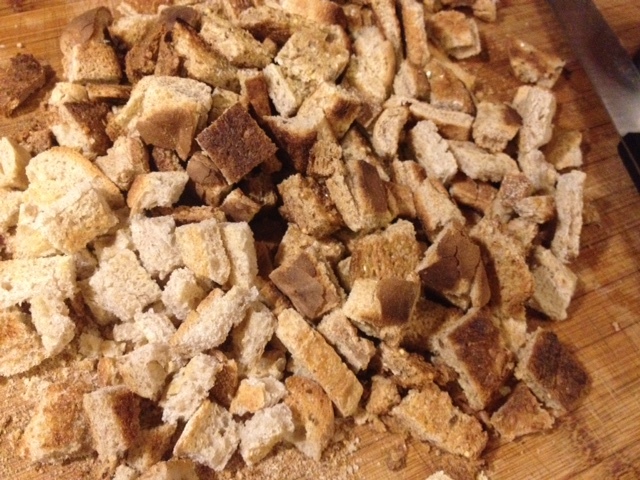 Remove bread from oven and cut it into cubes. Whisk together four eggs and two cups of liquid. I checked my refrigerator and found skim milk and some half and half. That didn’t quite equal two cups, so I added some of the mushroom stock that was simmering on the stove. 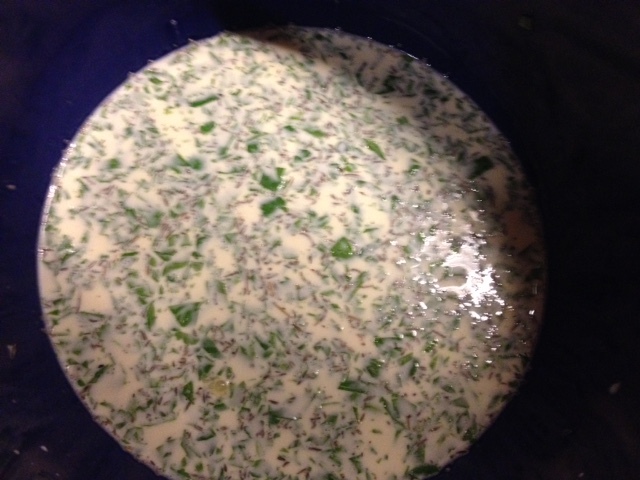 Add a few tablespoons of chopped fresh herbs, a teaspoon of dried herbs, a teaspoon salt and some freshly-cracked pepper. 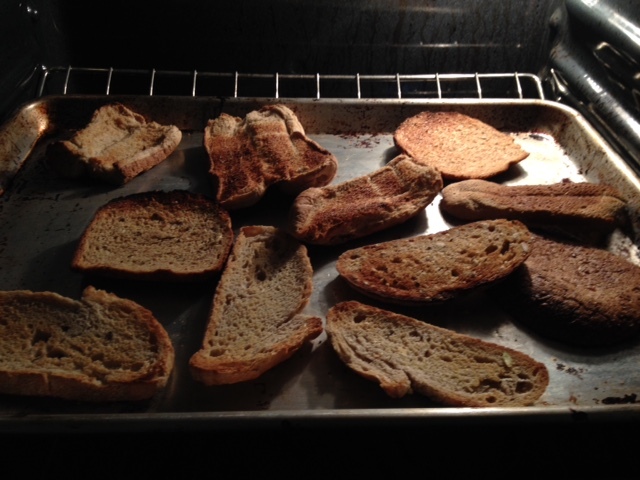 Allow toasted bread cubes to soften in the milk/egg mixture for ten minutes before adding the sautéed vegetables. Check your refrigerator for cheese and grate about 3/4 cup. 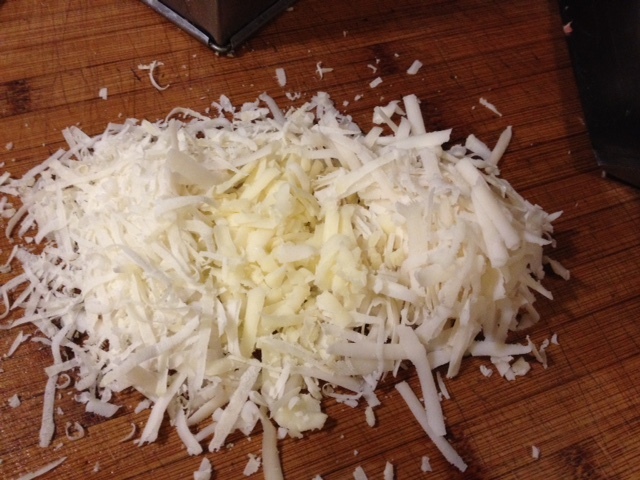 Here is a mixture of parmesan, goat gouda and jack cheeses. Stir in about 2/3 of the cheese, then spoon the mixture into lightly-buttered baking dishes. Top with remaining cheese. Bread pudding can be wrapped and stored in the refrigerator for several hours or overnight before baking. If I do this, I allow the dish to sit on the counter for 30 minutes before baking in a 350 oven. Sometimes I bake bread pudding in two smaller dishes rather than one large. I’m going to serve the portion on the left for dinner tonight. The dish on the right will be baked until just cooked through, then cooled, wrapped in foil, and stored in the freezer for a quick week-night meal. If the pudding seems like it has absorbed all of the liquid, add some stock or milk before baking. Delicious and fragrant bread pudding right from the oven. Bake at 350 until the top is golden brown and the pudding bubbles in the center.